November 1988 to November 2018 – the 30th birthday issue of Fly Me To The Moon fanzine. Bruce Rioch to Tony Pulis is maybe not such a stretch as Ayresome Park and the Holgate to the Riverside by the Tees or Hutton Road to Hurworth for that matter. But here is the podcast of the fanzine. A large slice of nostalgia but also a step forward into new territory. In this issue of the Fly Me To The Moon podcast we feature the poetic license of Jimmy Flynn. The Kat honours a Boro and England great in Alan Peacock but here’s where the rhyming reason comes in, he lets us step sideways into a fantastic scenario, another of Boro’s greatest sons, Captain Cook as a footballer! Shiver me timbers, the lad from Marton would most certainly not have said. As well as chewing the cud about Boro’s present progress in Championship and Carabao Cup we look ahead and debate the importance of the Wigan game. 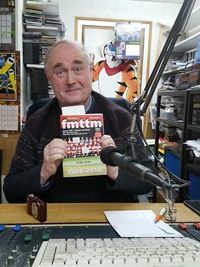 And now here is where you find an old Boro dog learning new tricks because this is a podcast within a podcast as we sandwich a bonus broadcast of the first instalment of an excusive Boro Lad Holmes mystery by Melvyn Small. We borrowed a group of actors from Saltburn, who were expert; although the fellas playing Alex and myself left something to be desired I thought Mel himself was celebrity door slamming good. Hope you enjoy this fmttm birthday podcast special.